Epidemiological studies in humans have implicated carriage of combinations of genes encoding certain KIR3DL1 (killer Ig-like receptor 3DL1) alleles and their HLA-Bw4 ligands in slower progression to AIDS, lower viral load and protection from infection. Given that the KIR3DL1*h/*y/HLA-B*57 genetic combination is strongly associated with favorable HIV outcomes, we measured responses from NK cells isolated from these individuals by multiparametric flow cytometry for cytokine secretion and degranulation in response to stimulation with HLA-devoid cells to assess whether the KIR/HLA compound genotypes linked to better HIV outcome favor increased NK cell functional potential. Our results indicate that NK cells from these individuals had increased functional potential, particularly in the KIR3DL1+ NK cell subset. These results support a link between KIR/HLA genotypes and NK cell function and could provide an explanation for the observation that some KIR/HLA combinations are associated protective phenotypes in the context of host-HIV interactions. As cells of the innate arm of the immune system, NK cells are important for tumor and viral control. However, given their potent cytolytic and cytokine secretion potential, their activity needs to be tightly regulated. The activation state of an NK cell is determined partly by the integration of stimulatory and inhibitory signals after interaction of surface NK cell receptors (NCRs), including the highly diverse killer Ig-like receptor (KIR) family, with ligands found on target cells (1). The polygenic and polymorphic KIR genetic region encodes for receptors with varying protein structures (2), ligand affinities (3–5), cell surface expression levels (6, 7), and types (activating or inhibitory) of transmitted intracellular signals (2). These subtle variations could explain why NK cells from individuals with certain KIR-ligand combinations seem better able to activate NK cell responses in the presence of specific pathogens (8–11). This has been highlighted by a number of epidemiologic studies linking the generic KIR3DS/L1 haplotypes with HIV disease progression or resistance to infection (8, 9, 12–15). The KIR3DS/L1 locus has the particularity of encoding for a highly polymorphic group of inhibitory alleles (KIR3DL1; hereafter, 3DL1) and a smaller set of activating alleles (KIR3DS1; hereafter, 3DS1), of which 3DS1*013 is the most common across several populations (16). The polymorphisms of 3DL1 alleles translate into molecules with cell surface expression levels that can be high (*h; 3DL1*001, *002, *008, *009, *015, and *020), intermediate/low (*l; *005, *006, *007, *028, and *053), or null (not expressed at the surface; *004) (4, 7, 9). In recent studies, various 3DL1 allotypes in combination with their known, or putative ligands, HLA alleles belonging to the Bw4 group, were shown to be associated with differential HIV disease progression, protection from opportunistic infections and viral load (VL) set point (8–10). The genotype conferring the highest protection compared with Bw6 homozygotes (hmz), who lack any HLA-B ligand for KIR3DL1, with respect to these outcomes, was a combination referred to as *h/*y+B*57. This genotype is composed of a 3DL1 genotype termed 3DL1*h/*y (i.e., lacking 3DL1*l alleles) with HLA-B*57, an HLA-Bw4 allele with an isoleucine at position 80 (i.e., Bw4-80I). In line with these findings, our group recently reported an association between carrying the *h/*y+B*57 combination with resistance to infection in a population of HIV exposed uninfected (EU) individuals (12). However, although these data support a role for NK cells in control of HIV that varies depending on carriage of *h/*y+B*57, there are few studies linking this KIR/HLA combined genotype to improved antiviral NK cell function. NK cells can be divided into two populations based on the intensity of the CD56 marker at the cell surface. CD56dim NK cells are the more cytotoxic subset, whereas CD56bright cells are poorly cytotoxic and preferentially secrete cytokines when activated (17, 18). However, the cytokine secretion and cytolytic functions are not exclusive to either cell subset (19–21). IFN-γ and TNF-α secretion as well as cytolysis have documented antiviral activity and are functions attributable to both NK and CD8+ T cells (18, 22–27). In HIV infection, where there is evidence that CD8+ T cells play a role in controlling virus, it is not so much the frequency or breadth of epitope recognition by these T cells, but rather the functional quality of their anti-HIV responses that correlates best with VL control (28, 29). This provided the rationale for characterizing the quality of NK cell functional potential by measuring secretion of cytokines (IFN-γ and TNF-α) and CD107a expression, a marker for degranulation (30, 31). To determine whether NK cells from individuals bearing the *h/*y+B*57 combination associated with distinct outcomes with respect to HIV infection could be distinguished based on functional potential, we stimulated PBMCs with HLA-devoid K562 cells and measured the frequency of NK cells displaying all possible functional patterns. We found that individuals carrying this KIR/HLA genotype combination associated with control of HIV had increased frequencies of polyfunctional NK cells compared with study participants carrying other Bw4 alleles and to Bw6 hmz individuals. A total of 61 HIV seronegative individuals were included in this study. These were recruited from amongst the participants of the St. Luc injection drug user (IDU) cohort or were the seronegative partner in a serodiscordant couple (13, 32, 33). Twenty-nine met the criteria for inclusion in an HIV EU population because they had at least five documented parenteral or mucosal exposures to HIV. The remaining 32 individuals were enrolled in the St. Luc IDU cohort but did not meet the criteria for classification as EUs either because of insufficient documented exposure to HIV or because their needle sharing was with partners of unknown serostatus. All 61 individuals included in this study are KIR3DL1 homozygous to eliminate any possible confounding effect on NK function of carrying the activating allele at this locus, KIR3DS1. Informed consent was obtained from all study subjects, and the research conformed to ethical guidelines of all the authors’ institutions. Genomic DNA was extracted from PBMC or EBV-transformed cells using a QIAamp DNA blood kit (Qiagen, Mississauga, Ontario, Canada). All sub-jects were typed for MHC class I alleles by sequence-based typing using kits from Atria Genetics (South San Francisco, CA). Assign software was used to interpret sequence information for allele typing (Conexio Genetics, Perth, Australia). KIR3DL/S1 generic genotyping was performed by PCR using two pairs of specific primers for amplification of either KIR3DL1 or KIR3DS1 as previously described (13). KIR3DL1 allotyping was peformed by sequencing KIR3DL1 exons as previously described (12). Single nucle-otide polymorphisms corresponding to the 3DL1 alleles were identified by aligning the sequenced DNA to a reference consensus sequence consisting of a contig of 3DL1 cDNA sequences. In this study, KIR3DL1*<high expression alleles included 3DL1*001, 3DL1*002, 3DL1*008, 3DL1*009, 3DL1*015, and 3DL1*020, and KIR3DL1*low expression alleles included 3DL1*005, 3DL1*007, and 3DL1*021. In addition, HLA-Bw6 hmz individuals were defined by the lack of any HLA-Bw4 epitope at the HLA-A and -B locus. PBMCs were isolated by density gradient centrifugation (Ficoll-Paque, Pharmacia Upsala, Sweden) from whole blood obtained by venipuncture into tubes containing EDTA anticoagulant or by leukapheresis as previously reported (34). The cells were then cryopreserved in 10% DMSO (Sigma-Aldrich, St. Louis, MO) with 90% FBS (Wisent, St. Bruno, Quebec, Canada). Cryopreserved PBMCs were thawed and resuspended at 106 cells/ml in RPMI 1640 (Wisent) containing 10% FBS (Wisent), 2 mM l-glutamine (Wisent), 50 IU/ml penicillin (Wisent), and 50 μg/ml streptomycin (Wisent). Brefeldin A (at 5 μg/ml, Sigma-Aldrich), monensin (at 6 μg/ml, Golgi Stop; BD Biosciences, Mississauga, Ontario, Canada) and anti-CD107a–FITC Ab (BD Biosciences) were added to the cells. One million PBMCs were stimulated with 1) MHC class I-devoid K562 cells (American Type Culture Collection, Manassas, VA) at a PBMC-to-target cell ratio of 5:1, 2) medium alone (negative control), or 3) PMA (1.25 μg/ml); ionomycin (0.25 μg/ml, Sigma-Aldrich) (positive control to ensure the cells being tested were able to respond; all stimulation data shown in the manuscript were from cells that generated positive stimulation results with PMA and ionomycin). Stimulated PBMCs were incubated 6 h at 37°C in a humidified 5% CO2 incubator. Cells were then stained for viability using the Aqua Live/Dead fixable dead cell stain kit (Invitrogen, Burlington, Ontario, Canada) according to the manufacturer’s instructions. PBMCs were then stained for cell surface markers with anti-CD56–APC, anti-CD16–Pacific blue (BD Biosciences), and CD3-ECD, CD158e-PE (also known as, Z27-PE, Beckman Coulter, Mississauga, Ontario, Canada) for 30 min. Samples were washed with PBS containing 1% FBS (Wisent) and 0.1% sodium azide (Sigma-Aldrich), fixed and permeabilized using the Fix and Perm kit (Invitrogen), and stained for intracellular cytokines using Alexa 700 conjugated anti–IFN-γ and PE-Cy7 conjugated anti–TNF-α (BD Biosciences) for 30 min. After washing, samples were fixed with a solution of 1% paraformaldehyde (Fisher Scientific, Ottawa, Ontario, Canada) and kept in the dark at 4°C until acquisition. The gating strategy used to analyze the functional profile of NK cells stimulated with K562 cells is available in Supplemental Fig. 1. For all analyses, NK cells were defined as CD3− and CD56+CD16+, CD56+CD16−, or CD56−CD16+. Boolean gating was used to determine the trifunctional (CD107a, IFN-γ, and TNF-α), bifunctional (any combination of two of the measured functions), or monofunctional (a single measurable function) profile of 3DL1+ (i.e., Z27hi), 3DL1− (i.e., Z27dim and Z27−), or all NK cells (3DL1+ and 3DL1− NK cells). Between 400,000 and 600,000 total events were acquired for each sample on a LSRII flow cytometer (BD Biosciences). Flow cytometry analysis for NK cell activation after K562 stimulation or for NK cell phenotyping was performed using FlowJo software version 8.7.1 (TreeStar, Ashland, OR). The data obtained were corrected for background using unstimulated cells before statistical analysis. Statistical analysis and graphical presentation were performed using GraphPad InStat 3.05 and GraphPad Prism 4.01. Mann-Whitney U tests were used for between-group comparisons. Wilcoxon signed-rank test was used to compare the percent of 3DL1+ to 3DL1− polyfunctional NK cells within individuals. Spearman’s correlation analysis was used to study the relationship between percent contribution of a response and its NK cell frequency. A p value of <0.05 was considered significant. For between-group comparisons of the percent contribution of NK cells with different functional profiles to the total NK cell response, a Bonferroni correction for multiple comparisons was applied by multiplying the p value by the number of functional profiles evaluated (n = 7) to give a corrected p value, which was considered significant if <0.05. The mAb Z27 (also known as CD158e) binds both KIR3DL1 and KIR3DS1. However, the fluorescence intensity of Ab binding to the inhibitory versus activating forms of these receptors differs, such that 3DL1+ NK cell (Z27hi) and 3DL1− NK cell (Z27dim or Z27−) are readily distinguishable (35, 36). All 61 individuals included in this study are 3DL1 hmz. Forty-five are carriers of both the KIR3DL1 receptor and its HLA-Bw4 ligand (termed 3DL1-Bw4 individuals) and 16 are Bw6 hmz individuals who carry no HLA alleles able to act as a ligand for any 3DL1 receptor. Using the Z27 Ab, we were able to assess the function of 3DL1+ and 3DL1− NK cells. It has been previously reported that expressing an NCR for self-HLA ligand leads to an increased NK cell response after stimulation with MHC-devoid K562 cells (37). As shown in Fig. 1, we observed a similar phenomenon for CD107a surface translocation, IFN-γ and TNF-α secretion. In 3DL1-Bw4 individuals, there was an increase in the percentage of 3DL1+ NK cells that were CD107a+, IFN-γ+, or TNF-α+ after K562 stimulation when compared with the percentage of 3DL1− NK cells (p < 0.0001 for all functions, Wilcoxon signed-rank test) (Fig. 1A–C, left panels). In Bw6 hmz (Fig. 1A–C, right panels), only TNF-α+ secretion differed significantly between 3DL1+ and 3DL1− NK cells (p = 0.0029, Wilcoxon signed-rank test). When 3DL1-Bw4 individuals were compared with Bw6 hmz, the percentage (median [range]) of 3DL1+ that were CD107a+, IFN-γ+, and TNF-α+ was greater in 3DL1-Bw4 individuals than in Bw6 hmz (11.4% [0.3–34.8] versus 6.4% [1.3–23.0], p = 0.0242), (15.0% [0.4–43] versus 6.1% [1.3–17.9], p = 0.0143), and (1.8% [0–12.1] versus 1.0% [0–5.8], p = 0.1891). There was no significant difference between 3DL1-Bw4 and the Bw6 hmz in the percentage of 3DL1− CD107a+, IFN-γ+, or TNF-α+ NK cells. Together, these results indicate that carriage of KIR3DL1 with its HLA-Bw4 ligand increases the functional capacity of 3DL1+ NK cells in response to stimulation with HLA-devoid cells. NK cells from individuals carrying KIR3DL1/HLA-Bw4 receptor-ligand pairs have a KIR3DL1+ subset with increased functional potential. 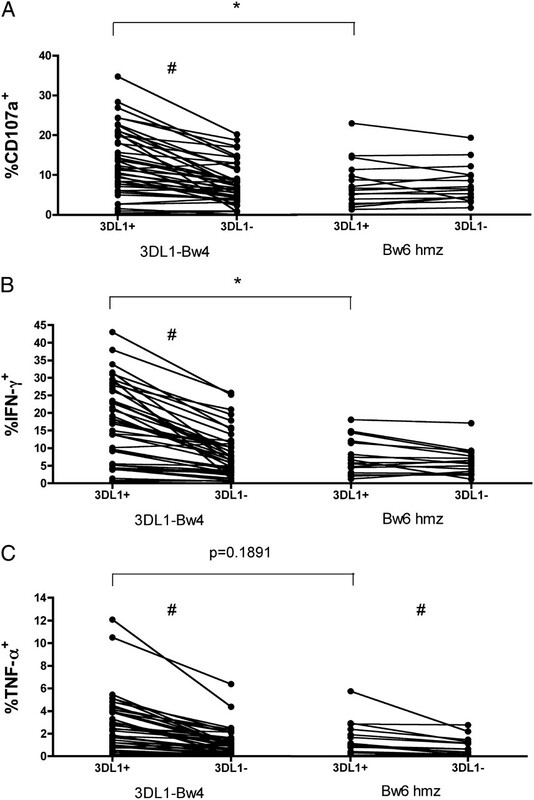 The before and after plots show the percent of total 3DL1+ or 3DL1− NK cells that are CD107a+ (A) IFN-γ+ (B), or TNF-α+ (C) in individuals who carry 3DL1-Bw4 receptor ligand pair (left-hand plots) or are Bw6 hmz (right-hand plots). A Mann-Whitney U test was used to assess the significance of between-group comparisons (3DL1-Bw4 versus Bw6 hmz) for each NK subset. p < 0.05 was considered significant and shown with an asterisk (*) over the line linking the two groups being compared. The number (#) symbol over the line linking two groups being compared represents a significant Wilcoxon signed-rank test comparing within-subject percent of 3DL1+ and 3DL1− NK cells that are CD107a+, IFN-γ+, or TNF-α+. Certain KIR3DL1 and HLA-Bw4 genotype combinations have been shown to be associated with time to AIDS and VL set point (9) or have been reported to be associated with a reduced risk of HIV infection in EUs (12). The 3DL1/Bw4 genetic combination that has been most strongly associated with these HIV outcomes is *h/*y+B*57 and this may be because this combined genotype confers a unique NK cell functional profile. To address whether NK cells from individuals carrying the *h/*y+B*57 combination have differential functional potential, we first measured the expression of CD107a and secretion of IFN-γ and TNF-α by NK cells in response to stimulation with K562 cells by eight-color flow cytometry in 11 subjects carrying *h/*y+B*57 and 16 Bw6 hmz. Of note, the median number of documented exposures to HIV was five (range: 0–92) in *h/*y+B*57 individuals and five (range: 0–134) in Bw6 hmz individuals (p = 0.5869, Mann-Whitney U test). Given that the NK cell response is characterized using three functional markers, eight different functional permutations are possible and define eight different NK cell subsets. However, only seven of these subsets define responsive NK cells, the eighth permutation being negative for all three functions. For each Bw6 hmz and *h/*y+B*57 individual, the frequency for each response pattern was assessed and the contribution of each combination to the total NK cell response determined. Fig. 2A shows that the contribution of trifunctional NK cells to the total K562 stimulated response was significantly greater in NK cells from subjects with the *h/*y+B*57 combination (corrected p = 0.0084) compared with NK cells from Bw6 hmz (median, [range]) (4.8% [0.7–11.0] and 2.8% [0.0–4.2] for NK cells from individuals typing as *h/*y+B*57 and Bw6 hmz, respectively, Mann-Whitney U test). Therefore, NK cells from individuals carrying the *h/*y+B*57 genotype combination associated with slower HIV disease progression, lower VL, and/or protection from HIV infection have a greater multifunctional potential on stimulation with HLA-devoid cells when compared with NK cells from individuals who are Bw6 hmz. No significant differences were detected between these two study groups for the percent contribution of any of the other NK cell functional profiles to the total NK cell response. Therefore, for subsequent analyses reported in this study, we have focused on results relating to NK cells having a trifunctional profile, although data on all functional profiles were collected and compared. NK cells from KIR3DL1*h/*y+HLA-B*57 positive individuals have a distinct functional profile. A, The percent contribution of seven different functional profiles to the total NK cell response to K562 HLA-devoid cells from individuals with carrying KIR3DL1*h/*y+HLA-B*57 (*h/*y+B*57, n = 11) and HLA-Bw6 hmz (Bw6 hmz, n = 16). Below the x-axis, dots refer to the presence of each functional marker (CD107a, IFN-γ, and TNF-α) in that profile. The height of each bar represents the median for the group and the height of the error bar the upper range for that group. An asterisk (*) over the line linking two bars indicates that the contribution of that functional subset to the NK cell response was significantly different in the two study populations. Trifunctional CD107a+IFN-γ+TNF-α+ NK cell contribution to the total response was compared between *h/*y+B*57 individuals and non-B*57 individuals who were *h/*y+80I, *h/*y+Bw4 or Bw6 hmz (B) and to *l/*x+B*57 individuals and non-B*57 individuals who carried *h/*y, *l/*x, or Bw6 hmz (C). A Mann-Whitney U test was used to assess the significance of between-group comparisons and p < 0.05 was considered significant. D, The correlation between a trifunctional response’s contribution to the total NK cell response and the frequency of NK cells expressing this function. E, The same analyses as in B but expressed as the percentage of NK cells. *h/*y+B*57 = cocarriage of an KIR3DL1*h/*y genotype with an HLA-B*57 allele; *h/*y+80I = cocarriage of an KIR3DL1*h/*y genotype with an HLA-Bw4 allele with an 80I of the HLA H chain that is not HLA-B*57; *h/*y+Bw4 = cocarriage of an KIR3DL1*h/*y genotype with an HLA-Bw4 alleles that does not have an 80I of the HLA H chain; *l/*x+B*57 = cocarriage of an KIR3DL1*l/*x genotype with an HLA-B*57 allele. The HLA-B*57 allele belongs to the Bw4 serotype and has an 80I. We questioned whether the increased trifunctional potential of NK cells from *h/*y+B*57 individuals was due to the presence of B*57 or could also be observed by NK cells from individuals with other HLA alleles belonging to either the Bw4 or Bw4-80I allele subsets. To answer this question, the trifunctional response of NK cells from non-B*57 individuals carrying KIR3DL1*h/*y with other Bw4 or Bw4-80I alleles was compared with the response from the *h/*y+B*57 group. The contribution of trifunctional responses by stimulated NK cells from *h/*y+B*57 individuals was greater than that from 20 non-B*57 individuals who were *h/*y+80I (3.0% [0.0–10.1], p = 0.039) or from nine individuals who did not belong to either previous groups but were *h/*y+Bw4 (1.2% [0.2–6.1], p = 0.0276) (Mann-Whitney U test) (Fig. 2B). The percent contribution of stimulated trifunctional NK cells in these later two study populations was not significantly different from that seen in Bw6 hmz. These results suggest that B*57 is unique among Bw4 and Bw4-80I HLA alleles in mediating increased NK trifunctional potential. To determine the role of 3DL1*h/*y in increasing NK cell function in *h/*y+B*57 individuals, the trifunctional response of NK cells from non-B*57 individuals carrying 3DL1*h/*y (n = 26) or 3DL1*l/*x (n = 10) was compared with the response from the *h/*y+B*57 group (Fig. 2C). Individuals carrying 3DL1*h/*y without B*57 had a lower NK cell trifunctional response contribution (p = 0.0083) when compared with the *h/*y+B*57 group (4.8% [0.7–11.0] and 2.5% [0.0–10.1] for NK cells isolated from individuals typing as *h/*y+B*57 and *h/*y non-B*57, respectively, Mann-Whitney U test). There was a nonsignificant trend toward an increased contribution of trifunctional NK cells to the total NK cell response in individuals carrying *h/*y+B*57 versus 3DL1*l/*x without HLA-B*57 (p = 0.0726, 4.8% [0.7–11.0] and 3.7% [0.5–5.8] for NK cells isolated from individuals typing as *h/*y+B*57 and *l/*x non-B*57, respectively). The percent of trifunctional NK cells from non-B*57 individuals carrying either 3DL1*h/*y or 3DL1*l/*x was similar to that seen in Bw6 hmz. Finally, only two individuals in our population typed as having the *l/*x+B*57 genetic combination, which was insufficient for statistical analyses. It is noteworthy, however, that the contribution of trifunctional NK cells to the total response of 0.6% and 2.5% was more similar to NK cells from Bw6 hmz individuals than from *h/*y+B*57 individuals. These data suggest that carrying *h/*y or B*57 alone is not sufficient for an increased NK cell functional potential and that both the receptor and ligand may be required. The data presented in Fig. 2A–C are reported as “percent contribution to the total response,” a measure often used to describe the quality of immune responses. The strength of a response is more accurately reported by the “frequency of total NK cells.” Both measures correlate with each other (R = 0.8134, p < 0.0001, Spearman correlation, Fig. 2D) and a similar conclusion is obtained when the frequency of NK cells is used to compare study populations as seen in Fig. 2E. Based on Z27 staining, it was possible to attribute function to either the 3DL1+ or 3DL1− NK cell subset for the populations carrying *h/*y+B*57 or Bw6 hmz. As shown in Fig. 3, the percent of 3DL1+ K562-stimulated NK cells that were trifunctional was greater in *h/*y+B*57 individuals than Bw6 hmz (1.4% [0.2–3.9] and 0.1% [0.0–1.5] for *h/*y+ B*57 and Bw6 hmz, respectively, p = 0.0004, Mann-Whitney U test). Although not as dramatic, this was also the case for 3DL1− NK cells in that the percent of trifunctional 3DL1− NK cells was 0.5% (0.0–1.3) and 0.2% (0.0–0.9) after stimulation of cells from *h/*y+B*57 subjects and Bw6 hmz, respectively (p = 0.0513; Mann-Whitney U test). Furthermore, within the *h/*y+B*57 group, trifunctional NK cells were more likely to be 3DL1+ (1.4% [0.2–3.9]) than 3DL1− (0.5% [0.0–1.3]) (p = 0.001, Wilcoxon signed-rank test) (Fig. 3). In contrast, in Bw6 hmz, the contributions of the 3DL1+ and 3DL1− subsets to the trifunctional NK response stimulated by K562 was similar (Fig. 3). In summary, the increased functional potential of NK cell from subjects carrying *h/*y+B*57 was most apparent in KIR3DL1+ NK cells. KIR3DL1+ NK cells account for most of the trifunctional contribution of stimulated NK cells from KIR3DL1*h/*y+B*57 positive individuals. The before and after plots show the percent of the total 3DL1+ and 3DL1− NK cells that are CD107a+IFN-γ+TNF-α+ in subjects who are KIR3DL1*h/*y+B*57 (left-hand plots) carriers and Bw6 hmz (right-hand plots). A Mann-Whitney U test was used to assess the significance of between group comparisons (*h/*y+B*57 versus Bw6 hmz); p < 0.05 was considered significant and shown with an astersk (*) over the line linking the two groups being compared. The number (#) symbol over the line linking the two groups being compared represents a significant p value resulting from a Wilcoxon signed-rank test comparing within-subject percent of 3DL1+ cells and 3DL1− NK cells that are trifunctional. In this report, we compared the functional profile of NK cells from individuals carrying different allele combinations of KIR3DL1 and HLA-B. NK cells from individuals with *h/*y+B*57 exhibited an increased contribution of trifunctional NK cells to the total HLA-devoid K562-stimulated response. This genetic combination has been previously linked to slower HIV disease progression, decreased VL, and/or protection from HIV infection (9, 12). For cells from individuals with the *h/*y+B*57 combined genotype, the increased trifunctionality was more likely to be seen in NK cells expressing 3DL1. HLA-B*57 is an HLA allele previously reported to be associated with slow HIV disease progression (9, 38–40). It has been reported that CD8+ T cell responses restricted by this allele may have unique qualities that influence the efficiency with which they control HIV (41–43). For example, CD8+ T cell responses restricted by HLA-B*57 contribute more to the total HIV-specific response during early infection, recognize a greater fraction of potential HIV-restricted epitopes, and are associated with a reduction in the level of the response restricted by other alleles carried by the same individual (41–43). However, given the role of NK cells in controlling viral infections through cytokine secretion and cytolysis, the potency, and polyfunctionality of these innate immune cells in HLA-B*57 individuals may provide an additional mechanism contributing to slow disease progression that has been linked to carrying this allele. Potent NK cell-mediated antiviral responses induced early in HIV infection may directly suppress HIV replication as well as induce dendritic cell maturation via a number of mechanisms, including IFN-γ secretion, favoring a Th1 response that could be beneficial in controlling the infection (44, 45). Although epidemiological data suggest a role for the *h/*y+B*57 combined genotype in controlling HIV infection, we could not exclude the possibility that carriage of B*57 was sufficient for increased NK cell trifunctionality. HLA-B*57 has a frequency of ∼6% in the predominantly white population from which the study subjects tested were drawn and the frequency of the *h/*y KIR3DL1 genotype is greater than that of the *l/*x genotype. For this reason, we were only able to test two individuals who were B*57 positive without carrying 3DL1*h/*y. The contribution of trifunctional NK cells in these two subjects appeared to be lower than that seen in the *h/*y+B*57 population. In *h/*y+B*57 individuals, NK cell trifunctionality occurred more frequently in 3DL1+ than 3DL1− cells. Given that HLA-B*57 is associated with HIV slow disease progression, within an HIV seropositive slow progressor population, we were able to identify six additional subjects who were *h/*y+B*57 and three who were *l/*x+B*57. The median percent contribution of NK cells with trifunctional potential after K562 stimulation was 3.2% and 1.24%, respectively (p = 0.03) (not shown). Because HIV infection has been reported to negatively affect NK cell function, we elected not to pool results from HIV-positive subjects with those shown for HIV-negative individuals shown in Fig. 2 (46). Taken together, these results suggest that B*57 is probably involved in the modulation of the NK response through its interaction with KIR3DL1. In contrast, because NK cells from subjects carrying Bw4 alleles other than B*57 or *h/*y KIR3DL1 genotypes without the B*57 ligand did not exhibit increased trifunctionality after stimulation with K562 cells (Fig. 2B, 2C), it is clear that B*57 plays a central role in modulating the NK cell functional profile. It is not known why this HLA allele is superior to other Bw4 or Bw4-80I alleles in favoring the development of polyfunctional NK cells. Among Bw4-80I alleles, which are particularly good receptors for 3DL1 (47–49), B*5705 and B*5711 (neither of which were present in our population) are the only members of the B*57 family that do not have a valine residue at position 97 (50). Of the other Bw4-80I alleles, only B*5813 has a valine at this position; the remaining Bw4-80I alleles have arginine, asparagines, threonine, tryptophan, or serine at this position (50). These residues differ markedly from valine in terms of either polarity or size. Although it is known that the amino acid at position 97 is involved in modulating the interaction between HLA-B and 3DL1, its precise role is still unclear (51). It is possible that the presence of a valine at position 97 influences receptor-ligand interactions, which directly affect NK licensing. Licensing is an NK cell maturation process in which cells acquire inhibitory KIRs for self-HLA ligands until tolerance to self is achieved (9, 21, 52). Mature NK cell subsets that express potent inhibitory receptors for self-HLA may therefore have greater activation potential when the inhibitory signal is interrupted through interactions with HLA-deficient cells such as K562 or HIV-infected cells, in which Nef downmodulates HLA-A and -B cell surface expression (53, 54). The licensing concept provides an explanation for how an inhibitory KIR, such as KIR3DL1, may play a role in NK cells function that ultimately influences activation of antiviral functions. Given that the *h/*y+80I genetic combination has also been linked to slower HIV disease progression, we expected that NK cells from individuals with this genotype would also have a greater functional potential when compared with Bw6 hmz. NK cells from 20 subjects who were *h/*y+Bw4-80I and nine who were *h/*y+Bw4 (but not Bw4-80I) were similar to Bw6 hmz in terms of their trifunctional potential after stimulation with K562. However, K562 stimulated a higher percentage of 3DL1+ NK cells from carriers of the 3DL1-Bw4 receptor ligand pair, including *h/*y+Bw4-80I individuals, than Bw6 hmz for measures of CD107a+, IFN-γ+, and TNF-α+ (Fig. 1). Even if *h/*y+B*57 carriers are excluded from this analysis, the significance of the pairwise comparison (i.e., %3DL1+ versus %3DL1−) is maintained in the 3DL1-Bw4 group (p < 0.0001 for all functions measured). The between-group (i.e., 3DL1-Bw4 versus Bw6 hmz) difference in the percentage of responding 3DL1+ NK cells falls below the level of statistical significance when *h/*y+B*57 individuals are excluded from the analysis. This may be due in part to the decreased sample size as suggested by the persistence of nonstatistically significant trends for these comparisons for IFN-γ secretion (p = 0.054) and CD107a expression (p = 0.1071). Therefore, although NK cells from *h/*y+80I individuals do not differ from those from Bw6 hmz in terms of trifunctionality, their 3DL1+ NK cells have a tendency to be more responsive for individual functions that play a role in antiviral immunity; this elevated responsiveness is most evident for CD107a translocation and IFN-γ secretion. It is also possible that the effects of *h/*y+80I on NK cell function would be better assessed using functional markers not measured by our experiments, such as perforin or granzyme, recently proposed to be better correlates of immune protection in HIV-specific T cell responses (22). Finally, perhaps the epidemiological effect observed on HIV disease progression in individuals with this genetic combination is dependent on the presence of the virus, as it has been proposed in the case of KIR3DS1 and HLA-Bw4-80I, another combined genotype linked to slower HIV disease progression (8, 55, 56). If this is the case, a different experimental system in which induction of the NK cells occurs in the context of HIV-infected cell stimulation may be required to observe the effect of the *h/*y+80I genotype on NK cell function (55). In HIV-infected cells, the Nef gene product downregulates surface expression of HLA-A and -B but does not affect HLA-C and -E levels, which are ligands for some NCRs. In addition, the presence of HIV viral peptides bound to the HLA molecules could influence their binding to KIR molecules. Thus, although K562 stimulation of NK cells provides insights into their functional potential, there are limitations associated with this method and the next step in understanding the mechanisms underlying the association of certain KIR/HLA combination with favorable HIV outcome would be to investigate the influence of these combined genotypes on NK function using HIV-infected cells as stimuli. As shown in Fig. 2B and 2C, we observed a high level of variability in the distribution of the contribution of the trifunctional responses in some genetic groups, such as the Bw6 hmz or *l/*x individuals. This variability may be the result of other KIR/HLA combinations or other NCRs that may be expressed at the NK cell surface. These could partly explain the absence of statistically significant differences in the contribution of the trifunctional NK cell response in *l/*x individuals when compared with the *h/*y+B*57 group. The effect of other HLA alleles on the variability of a response within a group is demonstrated by the Bw4 epitope at the HLA-A locus. Inclusion of individuals carrying the A*23, A*24, A*25, or A*32 alleles, which bear the Bw4 epitope and may interact with KIR3DL1, but not carrying any HLA-B Bw4 alleles in the Bw6 hmz population, increased the variability and the median of the trifunctional response observed in this control group (data not shown) (4, 9, 57). Therefore, the functional profile of NK cells is not likely to be solely dependent on KIR3DL1 and HLA-Bw4 interactions and a more complete understanding of NK cell functional profiles may depend on the consideration of the full genotypes of NCRs and their ligands. One possible limitation of this report is that the study population is at high risk for HIV acquisition. The majority of the individuals included belong to an injection drug user cohort; many (51/61) are positive for anti-heptatis C virus (HCV) Abs. Although injection drug use and HCV infection may affect NK cell function, the current study was not designed to address this issue. In our population, HIV-exposure, HCV-seropositivity and IDU are similar across KIR/HLA genetic groups, minimizing the possibility that any of these factors would bias our results. It will remain important to confirm our results in a low-risk population. In conclusion, we provide a link between a KIR3DL1/HLA-B genotype that has been associated with slower HIV disease progression and resistance to infection and increased NK cell functional potential. Understanding the mechanisms underlying these effects will contribute to our appreciation of the role of the innate immune system in HIV infection and may lead to new HIV vaccine design strategies. We acknowledge Martin Rioux for coordination of the St. Luc Injecting Drug Use cohort, Sylvain Gimmig, and Laurence Lejeune for their assistance in the development of panel of mAbs for multiparametric flow cytometry, and Benjamin Tallon, Saeid Sharafi, Marianna Kleyman, and Tsoarello Mabanga for technical support. This work was supported by the Canadian Institutes for Health Research MOP-79515 and the Fonds de la Recherche en Santé du Québec AIDS and Infectious Diseases Network. S.B. was supported by a Ph.D. scholarship from Fonds de la Recherche en Santé du Québec. 2008. Killer cell immunoglobulin-like receptors on NK cells: the how, where and why. Int. J. Immunogenet. 35: 1–8.
. 2006. The killer immunoglobulin-like receptor gene cluster: tuning the genome for defense. Annu. Rev. Genomics Hum. Genet. 7: 277–300.
. 2005. Crystal structures and KIR3DL1 recognition of three immunodominant viral peptides complexed to HLA-B*2705. Eur. J. Immunol. 35: 341–351.
. 2007. Cutting Edge: Allele-specific and peptide-dependent interactions between KIR3DL1 and HLA-A and HLA-B. J. Immunol. 178: 33–37.
. 2006. Putting the natural killer cell in its place. Immunology 117: 1–10.
. 2008. Novel KIR3DL1 alleles and their expression levels on NK cells: convergent evolution of KIR3DL1 phenotype variation? J. Immunol. 180: 6743–6750.
. 2006. Roles for HLA and KIR polymorphisms in natural killer cell repertoire selection and modulation of effector function. J. Exp. Med. 203: 633–645.
. 2002. Epistatic interaction between KIR3DS1 and HLA-B delays the progression to AIDS. Nat. Genet. 31: 429–434.
. 2007. Innate partnership of HLA-B and KIR3DL1 subtypes against HIV-1. Nat. Genet. 39: 733–740.
. 2006. KIR/HLA pleiotropism: protection against both HIV and opportunistic infections. PLoS Pathog. 2: e79.
. 2004. HLA and NK cell inhibitory receptor genes in resolving hepatitis C virus infection. Science 305: 872–874.
. 2008. A combined genotype of KIR3DL1 high expressing alleles and HLA-B*57 is associated with a reduced risk of HIV infection. AIDS 22: 1487–1491.
. 2008. Increased proportion of KIR3DS1 homozygotes in HIV-exposed uninfected individuals. AIDS 22: 595–599.
. 2005. Interaction between KIR3DL1 and HLA-B*57 supertype alleles influences the progression of HIV-1 infection in a Zambian population. Hum. Immunol. 66: 285–289.
. 2007. Synergy or independence? Deciphering the interaction of HLA Class I and NK cell KIR alleles in early HIV-1 disease progression. PLoS Pathog. 3: e43.
. 2007. Unusual selection on the KIR3DL1/S1 natural killer cell receptor in Africans. Nat. Genet. 39: 1092–1099.
. 2006. Human natural killer cell development and biology. Blood Rev. 20: 123–137.
. 2001. Human natural killer cells: a unique innate immunoregulatory role for the CD56(bright) subset. Blood 97: 3146–3151.
. 2006. Human NK cell education by inhibitory receptors for MHC class I. Immunity 25: 331–342.
. 2008. Lytic granule loading of CD8+ T cells is required for HIV-infected cell elimination associated with immune control. Immunity 29: 1009–1021.
. 2004. HIV-1-specific cytotoxicity is preferentially mediated by a subset of CD8+ T cells producing both interferon-γ and tumor necrosis factor-α. Blood 104: 487–494.
. 1986. Antiviral effects of recombinant tumour necrosis factor in vitro. Nature 323: 816–819.
. 1986. Tumour necrosis factors α and β inhibit virus replication and synergize with interferons. Nature 323: 819–822.
. 2004. Interferon-γ: an overview of signals, mechanisms and functions. J. Leukoc. Biol. 75: 163–189.
. 2001. The virus battles: IFN induction of the antiviral state and mechanisms of viral evasion. Cytokine Growth Factor Rev. 12: 143–156.
. 2003. Comprehensive epitope analysis of human immunodeficiency virus type 1 (HIV-1)-specific T-cell responses directed against the entire expressed HIV-1 genome demonstrate broadly directed responses, but no correlation to viral load. J. Virol. 77: 2081–2092.
. 2004. CD107a as a functional marker for the identification of natural killer cell activity. J. Immunol. Methods 294: 15–22.
. 2003. Sensitive and viable identification of antigen-specific CD8+ T cells by a flow cytometric assay for degranulation. J. Immunol. Methods 281: 65–78.
. 2005. A prognostic model for HIV seroconversion among injection drug users as a tool for stratification in clinical trials. J. Acquir. Immune Defic. Syndr. 39: 489–495.
. 1998. HIV-specific cytotoxic T-lymphocyte activity in immunologically normal HIV-infected persons. AIDS 12: 2125–2139.
. 2003. Changes in immunological and virological parameters in HIV-1 infected subjects following leukapheresis. J. Clin. Apher. 18: 55–60.
. 2007. Cutting Edge: KIR3DS1, a gene implicated in resistance to progression to AIDS, encodes a DAP12-associated receptor expressed on NK cells that triggers NK cell activation. J. Immunol. 178: 647–651.
. 2007. Detection of KIR3DS1 on the cell surface of peripheral blood NK cells facilitates identification of a novel null allele and assessment of KIR3DS1 expression during HIV-1 infection. J. Immunol. 179: 1625–1633.
. 2007. Hierarchy of the human natural killer cell response is determined by class and quantity of inhibitory receptors for self-HLA-B and HLA-C ligands. J. Immunol. 179: 5977–5989.
. 2000. HLA B*5701 is highly associated with restriction of virus replication in a subgroup of HIV-infected long term nonprogressors. Proc. Natl. Acad. Sci. USA 97: 2709–2714.
. 2003. Advantage of rare HLA supertype in HIV disease progression. Nat. Med. 9: 928–935. 1997. Host genes and HIV infection: implications and applications. Emerg. Infect. Dis. 3: 401–402.
. 2004. Quantifiable cytotoxic T lymphocyte responses and HLA-related risk of progression to AIDS. Proc. Natl. Acad. Sci. USA 101: 12266–12270.
. 2006. HLA Alleles Associated with Delayed Progression to AIDS Contribute Strongly to the Initial CD8(+) T Cell Response against HIV-1. PLoS Med. 3: e403.
. 2003. Influence of HLA-B57 on clinical presentation and viral control during acute HIV-1 infection. AIDS 17: 2581–2591.
. 2005. The reciprocal interaction of NK cells with plasmacytoid or myeloid dendritic cells profoundly affects innate resistance functions. J. Immunol. 174: 727–734.
. 2005. NK cells in HIV infection: paradigm for protection or targets for ambush. Nat. Rev. Immunol. 5: 835–843.
. 1994. NK3-specific natural killer cells are selectively inhibited by Bw4-positive HLA alleles with isoleucine 80. J. Exp. Med. 180: 1235–1242.
. 2005. 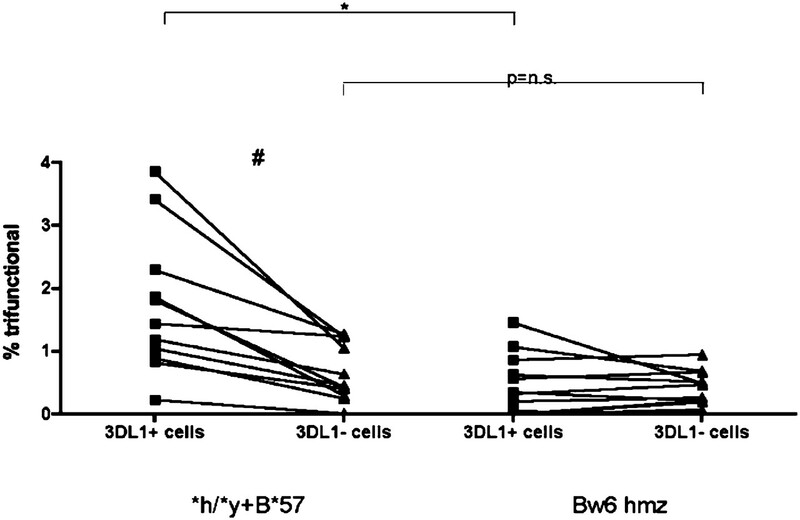 KIR3DL1 polymorphisms that affect NK cell inhibition by HLA-Bw4 ligand. J. Immunol. 175: 5222–5229.
. 1997. Conserved and variable residues within the Bw4 motif of HLA-B make separable contributions to recognition by the NKB1 killer cell-inhibitory receptor. J. Immunol. 158: 5237–5241.
. 2003. IMGT/HLA and IMGT/MHC: sequence databases for the study of the major histocompatibility complex. Nucleic Acids Res. 31: 311–314.
. 2008. Polymorphic sites away from the Bw4 epitope that affect interaction of Bw4+ HLA-B with KIR3DL1. J. Immunol. 181: 6293–6300.
. 2005. Licensing of natural killer cells by host major histocompatibility complex class I molecules. Nature 436: 709–713.
. 1998. HIV-1 Nef protein protects infected primary cells against killing by cytotoxic T lymphocytes. Nature 391: 397–401.
. 1999. The selective downregulation of class I major histocompatibility complex proteins by HIV-1 protects HIV-infected cells from NK cells. Immunity 10: 661–671.
. 2007. Differential natural killer cell-mediated inhibition of HIV-1 replication based on distinct KIR/HLA subtypes. J. Exp. Med. 204: 3027–3036.
. 2007. ‘Unleashed’ natural killers hinder HIV. Nat. Genet. 39: 708–710.
. 2008. Human leukocyte antigens A23, A24, and A32 but not A25 are ligands for KIR3DL1. Blood 112: 708–710.